More than a side dish, potatoes are an American culinary staple… and they come in all shapes, sizes, and colors. Chances are one of your favorite recipes is only complete when you add potatoes. Red, yellow, white, or classic Russet varieties – the rich, nutritious, full-bodied taste of potatoes can liven up your dinner table on a daily basis. Come check out our favorite meals for any occasion and get inspired with fresh & flavorful Potandon potatoes. Place whole potatoes in a small sauce-pot and cover with cold water. Add 1 tablespoon of olive oil, 1 tablespoon of salt, and a sprig of fresh rosemary. Simmer on medium heat until potatoes are tender, cooked all the way through, and you can pierce easily with knife. Drain and allow to cool. When potatoes are cool, cut in half and set aside. Combine all ingredients for sauce and season (according to your preference) with salt and pepper. Combine the shrimp, chopped rosemary, olive oil, lemon, and salt and pepper. 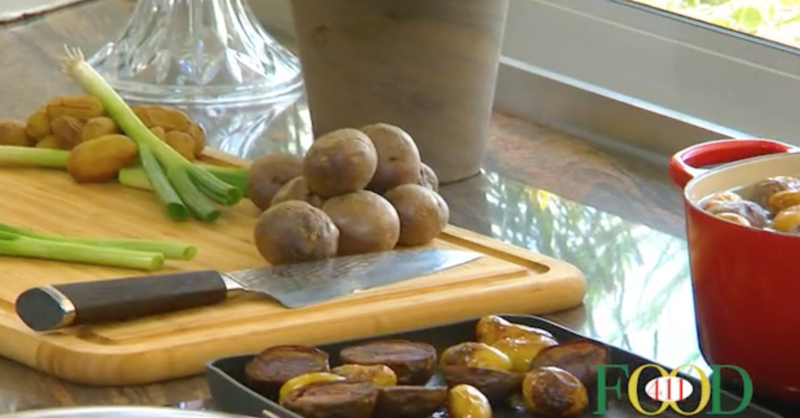 Toss the cut potatoes in 1 tablespoon of olive oil and place on grill pan to mark and warm through. Add the seasoned shrimp to grill and cook 2-3 minutes per side to cook through. Remove potatoes and combine with the sauce (except for a ½ cup) and the sliced scallions. Place potatoes on plate or platter. Add additional sauce to each plate and top with cooked shrimp.